TrendyKid the leading importer of UK and European products is pleased to announce their Starchild Shoes Summer 2004 Collection. This Summer 2004 collection of soft leather shoe designs has three new ranges, Country & Western, Tutti Frutti and Urban. Country & Western classic ginghams in various color waves with slip on designs as well as pretty ankle ribbons. Tutti Frutti brings vibrant fruits such as melon and cherry that will add zest to any young ones wardrobe. The new urban line reflects todayÂs trends of urban sport and combat wear for parents who like to keep little feet up to date. The inspiration for the urban line of shoes is taken from street wear fashions and trends of casual chic. 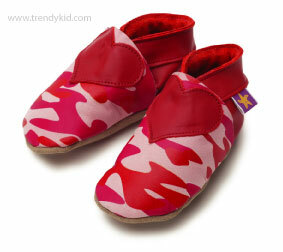 Starchild Shoes provide growing feet with the protection they need. Hand made in Britain from the finest Italian leather. Every pair comes with durable non-skid sueded soles that are ideal for bouncing, crawling, and early walking, even on tile or wooden floors. Colored with non-toxic dyes, they are safe for Âtoe suckersÂ and other orally curious infants.